Start your vacation in France with a night in Paris—“The City of Lights,” before transferring to Le Havre to board your Avalon Suite Ship® for a Seine River cruise. Enjoy a guided sightseeing tour of this city, part of the World Heritage Sites. 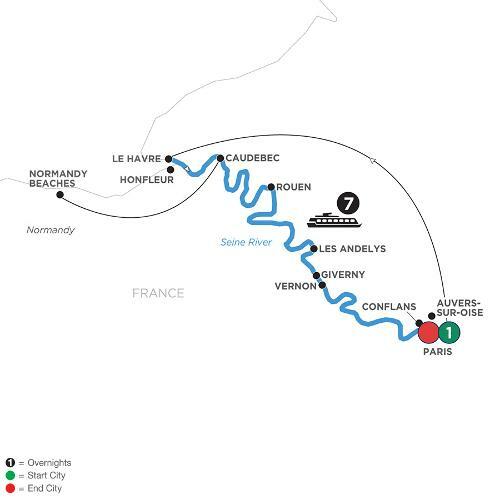 From Caudebec, you’ll take an excursion to Normandy for a selection of excursions to choose from. You may wish to tour the beaches at Normandy, with the memorials and monuments for the allied forces, or take a “Taste of Normandy” tour to discover the farming traditions and culinary specialties of this area. Continue to Rouen for a walking tour of the village where Joan of Arc was martyred, as well as the Notre-Dame Cathedral, and Astronomical Clock. Sail on to Les Andelys for guided tours of its picturesque village, and nearby castle ruins. Continue your picturesque river cruise through France to visit the home of master artist Claude Monet at the gardens of Giverny, or visit magnificent Bizy Castle. Next, cruise to Conflans—home of Van Gogh and Bonaparte, to see both provincial inspirations for the artist’s paintings, and grand opulence of the emperor’s home. Your river cruise along the Seine returns to Paris. See the sights in the heart of the city, including a visit to Notre-Dame Cathedral, or take a tour showing you the iconic sites of the Louvre Museum, Arc de Triomphe, Eiffel Tower, and more. You’ll long reflect on this this remarkable cruise on the Seine, with panoramic views and the remembrances of history, heroes, and artists brought to life.